Are you into wrench turning? Check out the gear from Husky! My very first socket set was a Christmas gift back when I was around 8 years old or so. My parents learned quickly that I took a liking to tools and fixed me up with a 15-20 piece kit that came in a zipper pouch. Coincidentally, it was made by Husky and purchased at The Home Depot : ) I’d love to say I still have the entire kit today, but unfortunately I lacked good “tool manners” as a kid and have since misplaced about all of the contents of that little kit. These days are a bit different in that my manners as a tool user have certainly changed but oddly enough the Husky brand still remains as one of the go-to hand tool companies you’ll find in my shop today. I’ve had a number of different tools trickle in form this Home Depot ProSpective tool review campaign. So far it’s been this large tool box which I value the most out of the lot. Not only is it home to my mechanics tool kit and new screwdriver kit but it’s also serving as a great storage box for loads of other bits-and-bobs I keep in the shop. If you’ve followed my content for any amount of time you’ve learned by now that I am not a major fan of building “drawer storage”. Instead, I love building functional storage solutions that are open and in clear sight. Recent case in point, my Ultimate Plywood Workbench. It’s a perfect example of functional shop furniture with plenty of storage in addition to a large 4’x8’ working surface. 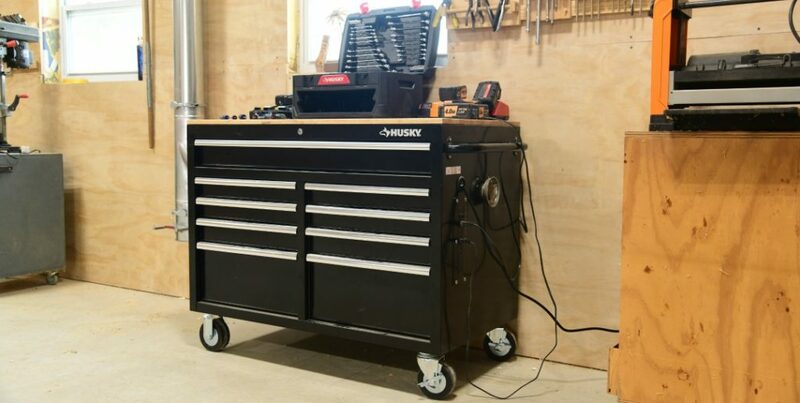 Even though this tool box is new to me, my husband has owned and worked out of Husky’s 52” x 64” for about 5 years now with zero issues out of it….and that thing is loaded to the gills! He came into it a bit by accident. While shopping for large boxes listed between $1,000 – $3,000, I noticed The Home Depot was selling the box he now owns for a sale price of just over $600. He couldn’t pass it up and has enjoyed great service out of it since. This Husky chest in my shop is basically the “kid brother” to his and I expect to have the same level of success he’s had in his mechanical shop. All the drawers feature ball bearing sliders and come with silicone rubber drawer liners straight out of the box. The box itself is made from 21 gage (~.033”) welded steel construction and weighs in around 210 lbs. Since it’s been in the shop, this box has moved all over the place and served the shop well. Moving it around is a breeze with the heavy duty locking casters, the wooden top takes a lickin and keeps on tickin and is totally replaceable once I beat it into saw dust over the years, and it comes from the factory with a built in power strip! Among many things, the box is home to a later and larger generation socket set compared to my old Christmas gift. This Husky socket set is intense! It’s over 430 pieces and ranges from 1/2” heavy hitters to the smallest of 1/4” bits. Much like the comparison between the two tool chests, this mechanics set can and will satisfy the needs of the majority of consumers. Since this set has been in my garage I’ve really used them all over the place from maintenance on my old Chevy, to tuning on my wood working equipment, and even some electrical panel work. All of the sockets and wrenches are made from forged chrome vanadium which can really take a beating. Chances are, if you look closely at the wrenches in your box right now, they’re made from forged chrome vanadium. The reason behind the use of Cr-V is based on durability, wear resistance, and toughness without sacrificing hardness. On average Cr-V measures between C41-C55 on the Rockwell hardness scale which places these tools right in the sweet spot for tools that are getting used a lot and require a high degree of wear resistance. Not far from this massive socket set sleeps these new trusty screwdrivers, also made by Husky : ) At first glance you may think “meh – they’re screwdrivers; big deal”….but you’d be over looking some sweet screwdriver coolness at the same time. The handle is over molded with rubber and comfy in the hand….no big deal. All the cool points are earned in the shaft and the driver tip. The shaft of the driver is made from a solid square cross section of hard tool steel. Although square shafts have less resistance to torsional stress compared to circular shafts, it becomes a moot point when we consider the loads an average user is going to impose on a screw driver. The major up side to a square shaft in my opinion having something to grab onto with something like a crescent wrench when hand strength simply won’t do. Experienced hands will know what I’m referring to here. Occasionally, you may need a bit of help turning stubborn screw heads. Often times that help comes in the form of a nasty set of pliers turning the handle as you smash the tip of the driver into the head of the stuck fastener. The down side to this approach is you’re gonna tear up the handle with the pliers….enter the square shaft! Simply grab onto the shaft with small crescent and you’re in business….no handle damage required. Last but not least is the diamond coated magnetic tip. Not sure how they do it but these magnetic tips have a gnarly coating on them that drive the “tip-grip” through the roof! This extra bit of traction reduces the chances of cam-out and increases your chances of getting stubborn fasteners broke loose. There may be other manufacturers doing the same thing out there some where but this is the first I’ve seen of a diamond coating on a screw driver tip. I haven’t had to really put the extra “tip-grip” to the test with rounded fasteners yet but I think they’re gonna hold up well. Thanks for the info April! ?? … Definitely going to check out Husky’s stuff, I can use a good screwdriver set at the moment, but the box and socket set will need to wait until I can finally get out of my small NY home.